Situated in the north corner of kuleni private game park is this dream site. Covered with thick indiginous sand forest,this is a piece of heaven waiting to be developed either with a holiday home or commercial lodge. There is current plans available. Due to the location this site is very private,and level. 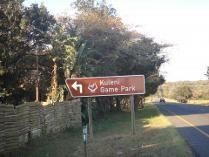 Kuleni game park (formerly "weavers nature park") is the product of many years or careful thought and planning. It's a warm and friendly place, created in the bush to give a feeling of safety and togetherness with the wildlife and the beautiful environment. It's a holiday getaway in kwa-zulu natal that is close to all the magic the elephant coast has to offer. Kuleni game park is 170 hectares. Of private reserve with17 sites,sectional title ownership,total privacy for each site commercial or residential lodges (maximum 10 beds),individually styled, eco-sensitive and timber structures. Peace, freedom and a sense of solitude, woven into four habitats:. Sandforest. Thornveld. Wetlands. Grasslands. . Kuleni game park offers: walking trails, game, warthog, giraffe, wildebeest, nyala, impala, zebra, duiker and other species. Excellent birding,over 250 species. Proximity to hluhluwe imfolozi park ,a big 5 game reserve. Proximity to the greater st lucia wetland park (isimangaliso wetland park), a world heritage site,and 70 km from sodwana bay.